There isn’t anyone who best knows the plight of an immigrant than an immigrant herself. Pulitzer Prize winning playwright (“Cost of Living”) and author of “Queens”, by Martyna Mojak, now getting an earnest airing at The La Jolla Playhouse, hails from Poland. As a child, she emigrated from her Motherland with her mother to New Jersey where her mother cleaned houses. 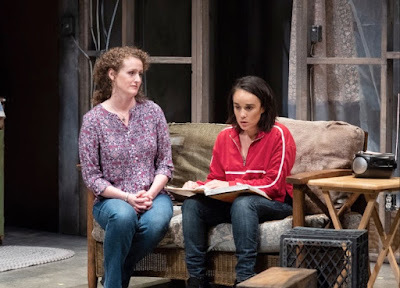 In her play “Ironbound”,that played at Moxie Theatre last year she talks of her mother’s experiences as a new immigrant in this country and the highs and lows of her job, earnings, relationships and finding a place for herself. Perhaps as a continuation and as a now adult living in Queens she puts herself or others like herself looking for refuge, in a time capsule between 2001 and 2016 some arriving on the shores of New Jersey others in Florida all to gain some ground for them, but mostly under the radar. 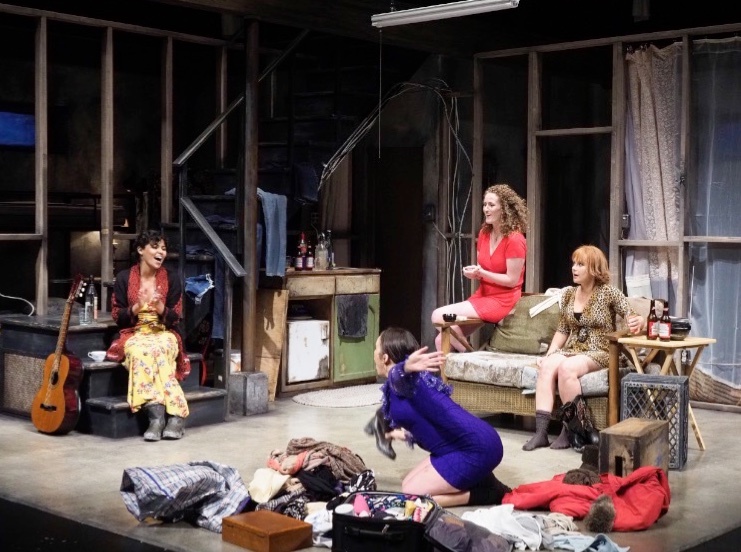 Six strong women played by Jolly Abraham, (Aamani/ Yara), Leslie Fray (Pelagiya/Dragana), Rae Gray (Inna/Tanya), Brenda Meaney (Renia), Melissa Miller (Agata and Xochitl Romero (Isabella/Glemys) all share a rundown (read illegal) basement apartment in a tenement building that is supposed to be a sanctuary for immigrant women; no questions asked. But there are more questions asked that there are answers. Or maybe that’s her intention. The play takes place over the course of 16 years and bounces back and forth in time muddying the waters. The women’s place of origin reads like a United Nations lineup: Poland, Ukraine, Belarus, Kosovo, Syria, Afghanistan, and Honduras. While the reasons they left are as varied as the countries from which they came they are tied together now because of geography and or fear of the unknown or of forming bonds. Phone calls are made, flashbacks come into the picture and when all is said and done we the audience will hopefully gain more insight into the mindset of those seeking asylum in a country that since its inception, opened its arms to all. As of now anyone coming to this land built on the backs of refugees seems to be playing a losing game. It’s no wonder these women want to stay under the radar! Making its west coast premiere “Queens” brings us into the mindsets of these hardworking women; women who work at jobs no one else will take. Some babysit, clean houses work as dishwashers, collect belongings like badges of courage since discussions revolve around how many hours worked equals a sleeveless top in say Walmart. All this is reflected in David Israel Reynoso’s set design with heaps and piles of clothes stacked up on the stage, clothes hanging from the rafters and clothes worn by the refugees designed by Denitsa Bliznalova representing, in some cases, their homeland. The dim lighting design by Lap Chi Chu is basement appropriate and Mark Bennett’s sound design is just this side of subtle enough to barely hear. Personalities differ but the fears are the same; fear of being forgotten, fear of being found, or of losing track of loved or of finding unwanted news of loved ones and fear of getting too close to one another for fear of losing that someone. 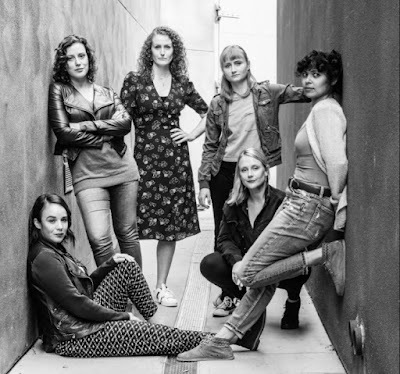 Director Carley Perloff (“A Splendid Thousand Suns”) has a most gifted and talented group of women, most making their La Jolla Playhouse debut, with which to work. Most play multiple roles and with accents to match their country of origin a reality that yours truly really found difficult to understand. The play that runs two hours and some will surely need some paring down and perhaps give more definition into the changing times frame, although most could relate the fears of 9/11. At a time when refugees are being treated like criminals instead of human beings Majok’s play is about as timely as any play in production right now. Would that the accents were easier to digest and morethe story lone defined, yours truly and those I’ve spoken with would have a better understanding. Thanks for sharing the post.Will come back again, Im taking your feed also,Love to read it,Waiting For More new Update and I Already Read your Recent Post its Great Thanks.